North Beach is one of San Francisco's most iconic, historic neighborhoods. When you're in North Beach, you feel like you're in a place with history. 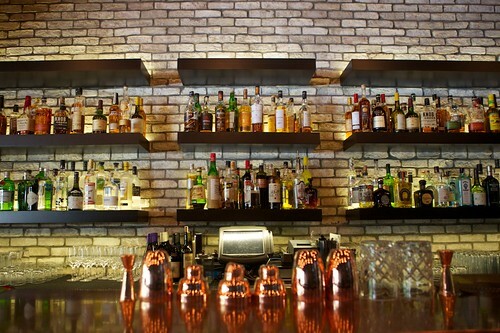 And Claire Sprouse's new bar program at the Square––an aptly named new restaurant across from Washington Square Park––it embraces North Beach. Claire didn't shy away from the 1970s and '80s style cocktails that were once (and in some places still are) so popular in North Beach. In fact, she took them in. She specifically designed her program to be a place North Beach locals would be proud to call their own. White Wine Spritz: Sherry, pineapple, black pepper, bitter lemon. 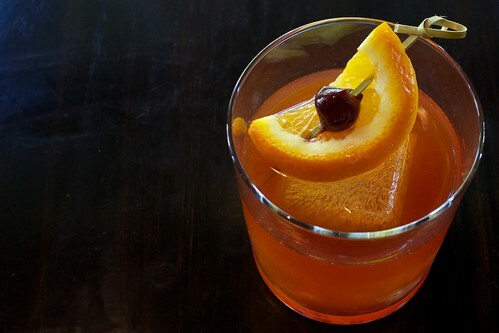 This sweet and savory drink is perfect for a warm day in North Beach. The mixture sounds a bit odd at first, but the black pepper and sherry work wonderfully together, and the pineapple and Fever Tree bitter lemon (lemon tonic water) likewise blend nicely. It's a light, low alcohol cocktail that Claire first created to please the "ladies who lunch," folks like her mom or grandma. You can sip on this drink all night and still be able to stand without swaying. 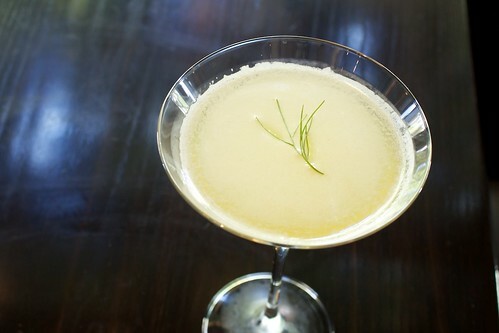 Apple-Tini: Clear Creek apple brandy, sour apple liqueur, lemon, honey, St. George absinthe, and Ron's fennel from the farm. Claire inherited a whole set of giant martini glasses when she first came to The Square. "The only thing going in there was Martinis," she joked. And so she came up with this playful Apple-tini, a twist on the sticky neon green drink we all know. Part of Claire Sprouse's genius is her playful variants of 1970s and 1980s cocktails. Her Apple-tini is a perfect example. If the name, or the "sour apple" in the ingredients, makes you nervous to try it, you're in for a treat. It's spicy, tangy, and tart, with a beautiful dill aroma that will keep your nose close to the cocktail. The apple pairs well with the fennel. It almost like an akvavit sour. 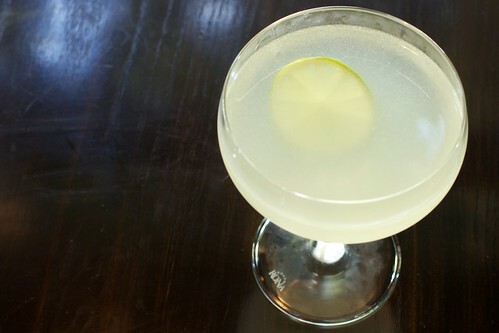 Classic Daiquiri (aka Claire's favorite drink in the whole world): whatever rum suits the weather and mood today, fresh-to-order lime, and sugar. 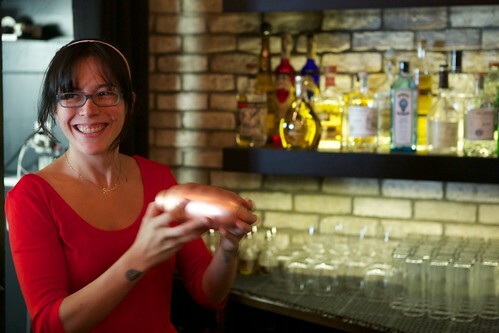 As a "spirits nerd," Claire actually does pick the rum that suits the day, so this drink will vary slightly day to day. She uses a 2:1 simple syrup ratio and the classic recipe, so it's a bit sweeter than the daiquiri you'll often find in San Francisco. All that means is that you shouldn't expect a mouth-puckeringly tart drink. 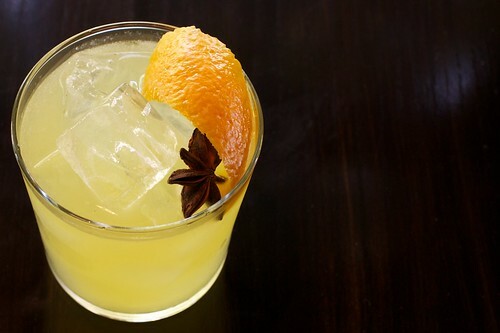 Harvey Wallbanger: vodka, Gran Classico, vanilla-orange cordial, and lemon juice. Mezcal instead of vodka makes it a Freddy Fudpucker. 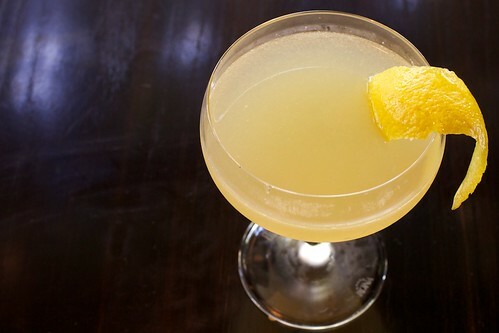 The drink is easy to drink, made to be highly approachable. "A drink shouldn't be so severe," Claire notes. Don't worry, though, there's no hyper-sweet orange concentrate in this drink. The Mezcal variant is fantastic. The smokiness works perfectly with Gran Classico and vanilla, and the lemon dries your palate out nicely at the end. Muddled Old Fashioned: bourbon, muddled fruit, sugar, and bitters. This isn't the jet fuel Old Fashioneds that you'll get at other craft cocktail establishments. Claire embraces the Mad Men version of the drink from the 60s, celebrating the softer side of the drink brought with muddle fruit. It makes it mellower and a tad sweeter and fruitier than what some of our readers are used to. Think of it like a totally different drink if you want to, but whatever you do, try it. 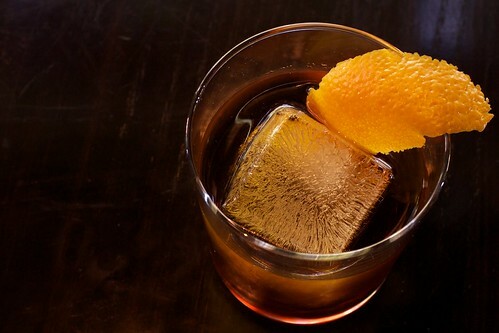 There was a reason this type of Old Fashioned was popular for so long. 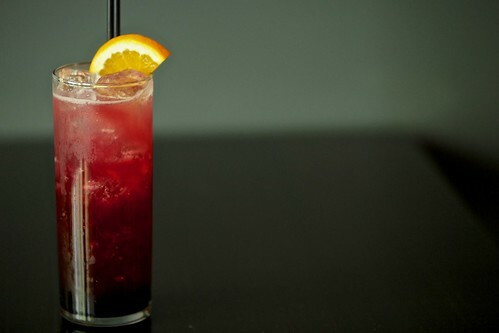 Tequila Sunrise: tequila, cassis, Campari, and lemon. 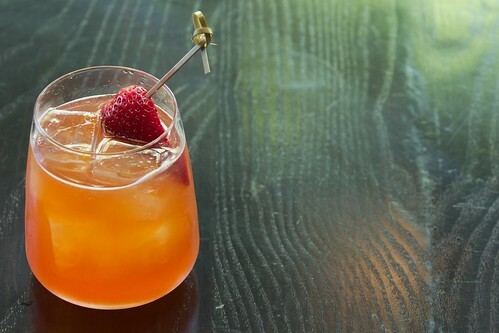 This drink is said to have been popularized by the Rolling Stones in the summer of 1968, a season they spent hanging out at the Trident in Sausalito drinking the cocktail. It became known as the Cocaine and Tequila Sunrise tour or the STP (Stones Touring Party). 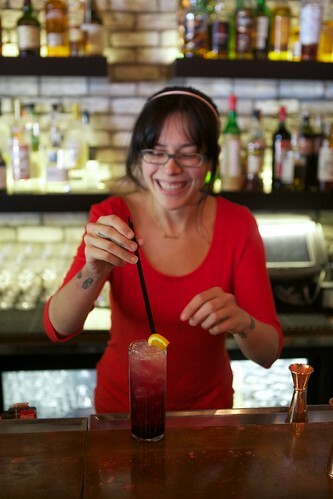 There are two version of this drink, one with luxardo and one with Cassis, and Claire opts for the cassis version of the cocktail. As Claire's glee below indicates, this is another one of her little jokes. This drink ain't like no Tequila Sunrise you've ever had. There's a perfect combination of sweet, savory, and tart that hits your palate in all the right ways at all the right times. You'll find yourself drinking this guy dangerously fast, so be careful. Twentieth Century Cocktail: gin, cacao, lillet blanc, lemon. Actually, this drink is pretty straightforward. It's simple and delicious, and perfect for the "choco-tini crowd" because the cacao floats nicely above the other flavors. Claire-ified White Russian: rye or vodka, coffee, milk, allspice. The Dude himself would be left speechless at this riff on the White Russian. You might think they got your order wrong you get the Claire-ified White Russian. The name, however, is not just indicating that this is Claire's version of the drink, but that it uses clarified milk––in fact, Claire's far too modest to name a drink after herself. She was strong-armed into using this name. 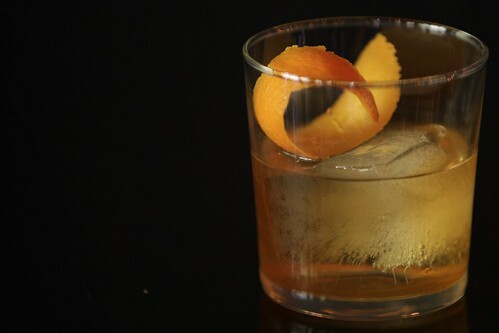 The drink itself is as playful and incredible as the other '70s and '80s drinks on the menu. It's got all the creaminess and richness of a White Russian, but far smoothers and less heavy. It's a perfect dessert drink. Wooden Nickel: apple brandy, sweet vermouth, cynar. This is Claire's after-dinner version of a Negroni. If you want to slow down your alcohol consumption for the evening, or have an appetite stimulant before dinner, reach for this one. The name is based off of the many wooden nickels that the staff found when they were building the place out. They used to be tokens that would get you a free drink at the bar. Open every night 6pm-1am, food all night.